Driving past Cheltenham Racecourse the other day I noticed that the next Race Meeting is not until 23/24th October. And, the National Hunt Season proper gets under way on 13/14/15th November. This seems such a long way off I got to wondering what happens there during the ‘Off-season’, so I decided to pop up there this Sunday and find out. It was a revelation! In the UK most horse racing is on turf although there are a few all weather tracks. I guess the ‘going gets tough’ during the summer months when the ground is hard and dry, making it dangerous for thoroughbred racehorses to jump the fences. Every racecourse is different whether it is for flat racing, National Hunt racing, or point to point. Few are a regular oval shape and different horses run better on different tracks ~‘horses for courses’, as the saying goes. Flat racing is run over distances between 5 furlongs (5/8 miles) and 2 miles with no fences to be jumped, while National Hunt racing, as at Cheltenham, is between 2 miles and 4 1/2 miles with challenging obstacles to be jumped. At Cheltenham these include hurdles, fences and water jumps. These races are strictly governed and the jumps, although terrifying, are built with safety in mind. Point to Point races on the other hand are much more ‘informal’ and for amateur riders. I have only watched a couple of point to points and I found them terrifying. The jumps are horrendous and riders often fall and end up covered in blood! Cheltenham Racecourse is very special and world famous. The Cheltenham Festival is unmissable for any serious racing fan. It is held annually in the third week of March around St Patrick’s Day. The atmosphere is electric and the whole town comes alive. Race fans come from all over the UK, Southern Ireland and beyond to enjoy the four day meeting. There is a Championship Race each day, the highlight being the Gold Cup race. This year the weather was perfect for spectators with early spring sunshine, although the horses may have found the ground a bit hard. The Gold Cup is a Grade 1 race, run over a distance of 3 miles 2 1/2 furlongs. All the horses carry the same weight in the Gold Cup and the hill to the finish is a test of their stamina and courage. Famous winners of the Gold Cup include Dawn Run (a mare, ridden by Jonjo O’Neill), Arkle (considered the greatest horse of all time), Golden Miller, Best Mate, Desert Orchid & Kauto Star. Racegoers, and non-racegoers alike, grow attached to individual horses as they each have their own personality and style. In National Hunt racing the horses do not have to be thoroughbred, which adds an extra twist to the races. Of course there are lots of breeders, trainers and stables in the Cotswolds so it is possible to see these beautiful creatures out galloping occasionally which is wonderful. So what is going on at the racecourse before then? Well lots of things as I discovered. There is an amazing building at the racecourse, appropriately called the Centaur (half man/half horse)! This building seats over 2000 people (4000 standing) and has some beautiful spaces inside including the gorgeous Steeplechasing hall of Fame. During the ‘off-season’ it hosts music festivals, craft shows, business meetings, seminars, conferences, graduation ceremonies for the local university as well as being a fabulous wedding venue. Outside the Centaur in the grounds around the racetrack there is lots of activity too as you will see from my photos. There is a permanent facility for Riding for the Disabled and the racecourse has its own railway station which still has steam trains running. This is operated by the Gloucestershire Warwickshire Railway GWR and is run mainly by volunteers. The station, signal box and platform take me right back to my childhood and day trips to the seaside. But now visitors can steam through the Cotswolds enjoying the scenery. It is marvellous. 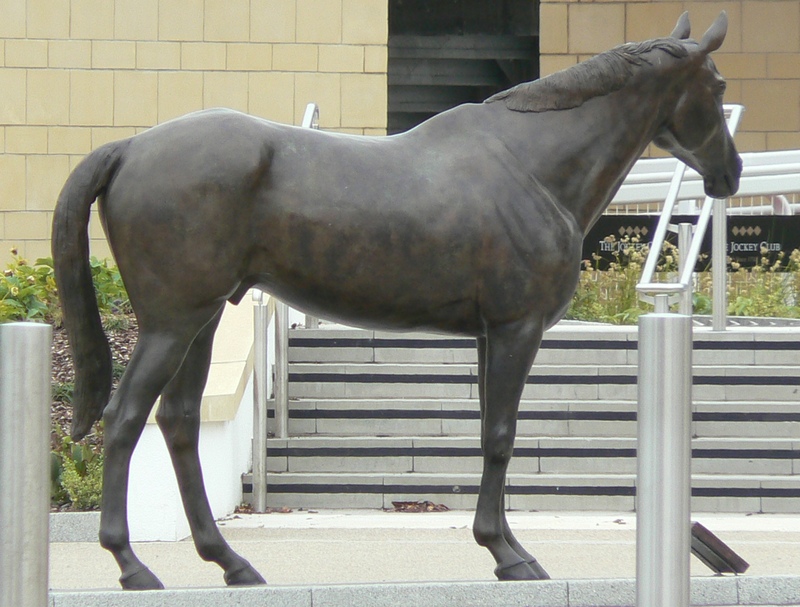 There are some great statues around the racecourse of Gold Cup winners Golden Miller and Arkle, as well as dawn Run, and Best Mate and of course the Centaur. Some of these were removed while the £45million building work is going on but I did find one or two. The fabulous new stand and walkway is due to be ready for the 2016 Festival and I must say it was looking great today. Another permanent feature near the entrance to the racecourse is a veterinary block complete with tackle shop, offices etc. And, in the car park of this building is a waiting area for emergency vehicles and responders. Also in the grounds was a temporary ‘big top’. This beautiful blue and white tent was the circus with a purpose, Circus Starr, a wonderful charity bringing fun and excitement into the lives of disabled and disadvantaged children and their families. I was so jealous that I didn’t have a ticket as I stood outside and enjoyed the music from Frozen waft out from the big top. I could hear gasps of pleasure at what I assumed were trapeze artists doing aerial dances to ‘Let it Go’. Apart from this there were dog walkers, joggers, cyclists, and a young lad riding a motorbike as well as builders creating the new walkway. This entry was posted in Cotswolds, Musings, Photography, Travelogue, Weekly Photo Challenge and tagged Cheltenham, Cotswolds, Weekly Photo Challenge. Bookmark the permalink. t sees like a busy event centre. I never got to the races at Cheltenham when I lived in England. Wasn’t interested then. Chances and opportunities slip by all the time. Maybe one day you’ll come back and I can take you!